First consists of one input and two outputs. The automobile differential is the best example here. The two outputs are connected mechanically. Second application has two inputs and one output. This is used to solve industrial problems when the superimposition of one motion relative to another is required, such as phase shifting on textile industry equipment. Differential efficiency is a function of the relative speed of the three elements. 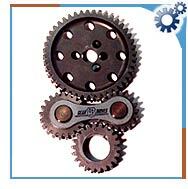 As relative speed increase, the inherent losses due to basic gear efficiency, seals, and bearings also increase; thus efficiency decreases.